We specialize in Custom Nets! Also known as vertical debris netting, rolls come in all sizes in order to wrap a building and provide protection to construction sites as well as pedestrians, and innocent bystanders. Debris safety netting complies with OSHA regulations. 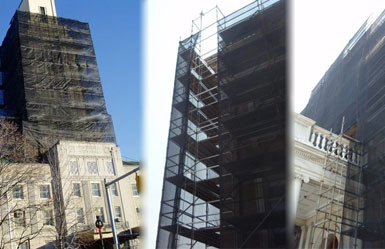 Our Debris safety netting panels comply with OSHA regulations. Custom cut and configured to meet any special requirement needed at your construction site. Shope our custom cut and reinforced debris net panels. Fall safety protection made with high strength synthetic mesh for rigorous conditions. Our personnel safety netting is tested to exceed ANSI A10.11. Shock absorbing diamond mesh netting is treated with inhibitors that protect it from UV degradation. 5 foot by 10 foot high tenacity mesh built to meet rough construction demands. Treated with inhibitors to avoid UV degradation. Made in the USA. OSHA compliant. Fall safety nets tested to exceed ANSI A10.11. 15 foot by 20 foot high tenacity mesh built to meet rough construction demands. Treated with inhibitors to avoid UV degradation. Made in the USA. OSHA compliant. Fall safety nets tested to exceed ANSI A10.11. 10 foot by 40 foot high tenacity mesh built to meet rough construction demands. Treated with inhibitors to avoid UV degradation. Made in the USA. OSHA compliant. Fall safety nets tested to exceed ANSI A10.11. 10 foot by 20 foot high tenacity mesh built to meet rough construction demands. Treated with inhibitors to avoid UV degradation. Made in the USA. OSHA compliant. Fall safety nets tested to exceed ANSI A10.11. 5 foot by 10 foot high tenacity mesh built to meet rough construction demands. Debris liner added for additional protection from falling tools and debris. Treated with inhibitors to avoid UV degradation. Made in the USA. OSHA compliant. Fall safety nets tested to exceed ANSI A10.11. 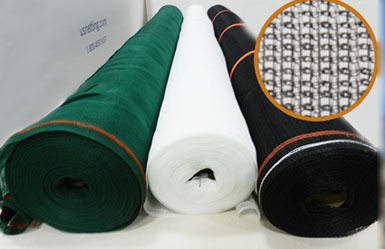 Fire retardant heavy-duty knitted polyethylene debris netting roll with reinforced border, no grommets. Available only in white with orange stripes. All listed sizes are in feet. 8.5 foot by 150 foot black or white knitted polyethylene debris netting roll with reinforced border, no grommets. All sizes listed in feet. 4 foot by 330 foot black mesh insulation netting to provide reinforcement of insulation. Don't resort to metal bars. Our netting will not deform the insulation allowing the R values to remain at optimum levels. Heavy-duty fire retardant knitted polyethylene debris net with reinforced border and grommets (approx every 18 inches. Available in black only, Sizes are listed in feet). Heavy-duty knitted polyethylene non-fire retardant debris netting panels with reinforced border and grommets (approx every 18 inches. Available in Black - Sizes in listed in feet). 10 foot by 150 foot black with orange stripe fire retardant debris net rolls. All sizes in feet. Roll has reinforced border for added strength but does not have grommets. 8.5 foot by 150 foot fire retardant black with orange stripe knitted debris netting roll with reinforced border, no grommets. Polyethylene mesh to catch falling tools and debris. 5.5 foot x 150 foot Fire retardant standard debris net roll. Hole opening of approx. 1/4 inch. Knitted polyethylene threads with reinforced border. Lightweight stays flexible in the cold weather. 10.5 foot by 150 foot NON-Fire retardant standard debris net roll. Hole opening of approx. 1/4 inch. Knitted polyethylene threads with reinforced border. Available in Black. Lightweight stays flexible in the cold weather. 10.5 foot by 150 foot fire retardant standard debris net roll. Hole opening of approx. 1/4 inch. Knitted polyethylene threads with reinforced border. Lightweight stays flexible in the cold weather. 12 foot by 150 foot fire retardant standard debris net roll. Hole opening of approx. 1/4 inch. Knitted polyethylene threads with reinforced border. Lightweight stays flexible in the cold weather. 4 foot by 150 foot fire retardant standard debris net roll. Hole opening of approx. 1/4 inch. Knitted polyethylene threads with reinforced border. Lightweight netting stays flexible in the cold weather. 8.5 foot by 150 foot fire retardant standard debris net roll. Hole opening of approx. 1/4 inch. Knitted polyethylene threads with reinforced border. Lightweight stays flexible in the cold weather. Custom hatch netting fall-through protection system drastically reduces the risk of death or injury from a fall-thru in hatch installations and floor openings. Comes with stainless steel brackets for easy attachment. 15 foot by 20 foot high tenacity mesh built to meet rough construction demands. Debris liner added for additional protection from falling tools and debris. Treated with inhibitors to avoid UV degradation. Made in the USA. OSHA compliant. Fall safety nets tested to exceed ANSI A10.11. 10 foot by 40 foot high tenacity mesh built to meet rough construction demands. Debris liner added for additional protection from falling tools and debris. Treated with inhibitors to avoid UV degradation. Made in the USA. OSHA compliant. Fall safety nets tested to exceed ANSI A10.11. 10 foot by 20 foot high tenacity mesh built to meet rough construction demands. Debris liner added for additional protection from falling tools and debris. Treated with inhibitors to avoid UV degradation. Made in the USA. OSHA compliant. Fall safety nets tested to exceed ANSI A10.11. 20 foot by 25 foot high tenacity mesh built to meet rough construction demands. Treated with inhibitors to avoid UV degradation. Made in the USA. OSHA compliant. Fall safety nets tested to exceed ANSI A10.11. 25 foot by 50 foot high tenacity mesh built to meet rough construction demands. Treated with inhibitors to avoid UV degradation. Made in the USA. OSHA compliant. Fall safety nets tested to exceed ANSI A10.11. Custom hatch netting fall-through protection system drastically reduces the risk of death or injury from a fall-through in hatch installations and floor openings. 20 foot by 25 foot high tenacity mesh built to meet rough construction demands. Debris liner added for additional protection from falling tools and debris. Treated with inhibitors to avoid UV degradation. Made in the USA. OSHA compliant. Fall safety nets tested to exceed ANSI A10.11. Our guardrail/toe board system is designed to provide superior personnel and debris safety. 1/8" Mesh (Black only) Lateral Force-540 lbs., Breaking Strength-105 lbs./in., Bursting Strength-192 psi. Carton of scaffold clips great for securing debris netting to your application. Carton Includes 100 clips, each clip is 11" long. Guardrail base plates anchor to floor slab with power actuated fasteners. Box of 50 plates.